Users of Amazon’s online storage service can now view all their files on iOS and Android, but there’s still no way to edit or upload. 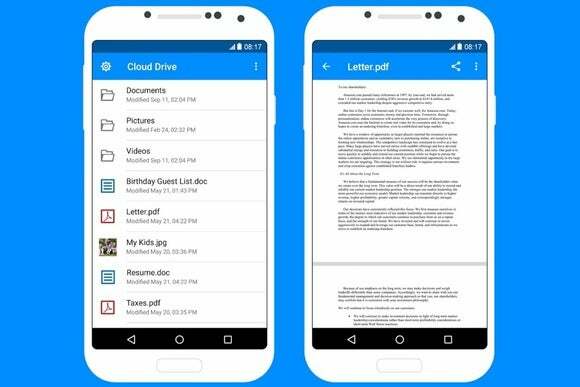 Amazon is inching closer to having a complete cloud storage solution with new Cloud Drive apps for iOS and Android. The new apps allow users to view files and folders, preview documents and photos, play videos and music, and share files to other apps. It’s intended as an all-purpose complement to the photo- and music-specific apps that Amazon already offers, with an emphasis on productivity. Cloud Drive is Amazon’s answer to online storage services such as Dropbox, Google Drive, and Microsoft OneDrive. At $60 per year, it’s the cheapest unlimited storage plan you can get. Amazon also offers a $12 per year plan with unlimited photo storage and 5 GB for all other files, though Amazon Prime subscribers get this benefit for free. The problem with Amazon’s service is that it’s just not competitive on features, even as it undercuts its rivals on pricing. For instance, Amazon still doesn’t offer a proper desktop sync app, so the only way to add files from a computer is through a drag-and-drop interface. That’s a non-starter for users who want to automatically make their documents or photos folders accessible through the cloud. The new mobile apps are even more limited. Currently, there’s no way to move files around, edit files, or upload new ones. Users can still upload photos using the sync feature in Amazon’s Photos app, but editing and syncing a document isn’t possible from phones or tablets right now. At least Amazon tells TechCrunch that it plans to invest in both apps going forward. Why this matters: Cloud storage could become a killer app for Amazon, with low prices and helpful tie-ins to the company’s other devices and services. While it’s still hard to recommend for now, the new apps are a sign that Amazon is starting to take its feature set more seriously.